This week is from another place I went to last week. This is the Victoreen building. As you can see it's in the process of demolition so this could be some of the last pictures from there. 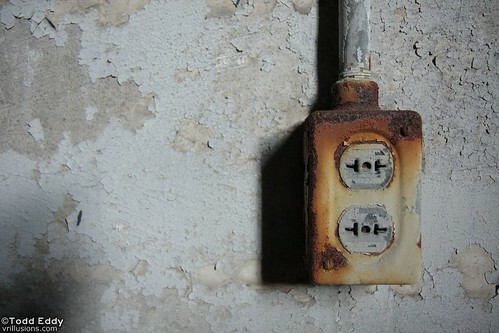 I picked this picture since it's something different than deteriorating walls. Unfortunately it was too dark to completely freeze the action. I would have used my flash but there was no where nearby to set up the flash. To use a flash to stop time it works best when the flash is set to it's lowest possible power which yields the fastest flash time. There are a lot more pictures--and they're more interesting than this--in the gallery. This week I went with Brandon to a few different places, so this is going to be another two week one because I went two new places I haven't been before. This week is a new place from what we're aware of. Just happened upon it while looking in one area. It's near the city waterworks so could have had something to do with that. Possibly thinking it was for filling trucks with something since there were large hoppers in there. First time I'm technically posting late but if you consider this a long weekend then it's still on time. This week I finally got back into exploring and checked out this abandoned church. Right in the middle of a sketchy part of Cleveland sits this church. 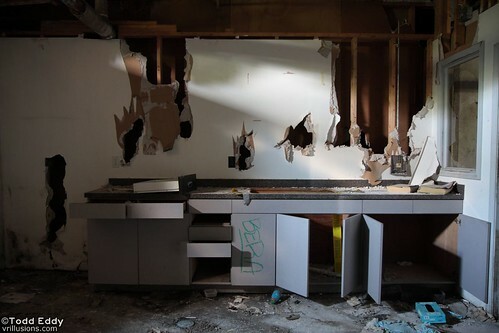 I guess it was bought by someone that was going to renovate it. They ripped up the floor and then I guess decided not to bother with it. Surprised there wasn't more graffiti. The artwork has faded away a lot, though. Haven't done many pictures where I just focus on a certain object like this. I'll take them and they'll be in the gallery but I won't make it the picture I post on here. 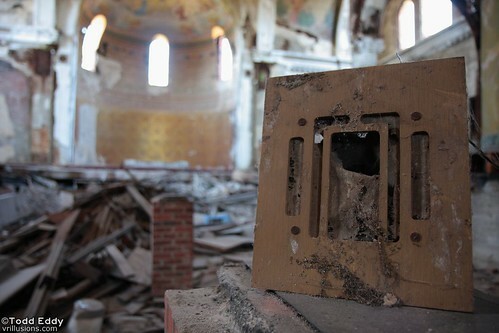 I like how this conveys a story, it can spark curiosity on what was said over the speakers back when this was in use (this looks like a PA speaker, not one that would have been used for sermons). Rest of the pictures can be found here. It was 9:00 PM on Sunday (my weekly POTW cutoff is midnight on Sundays) and I still had no picture for this week. So I packed up the car and just started driving around in hopes of finding something. First plan was to get a picture overlooking the Cleveland Zoo. I went to a nearby bridge and the rain forest exhibit wasn't all that impressive looking so that was out. Then thought I'd do a night shot overlooking the industrial area in Cleveland. Well I drove to where I thought would be a good spot and turns out it just gets a picture of the shopping center and it wasn't a good one. Fortunately this spot was near a roundabout that I could get some good light trails from. Thus that's how the picture above came to be. I'm not completely happy with it. 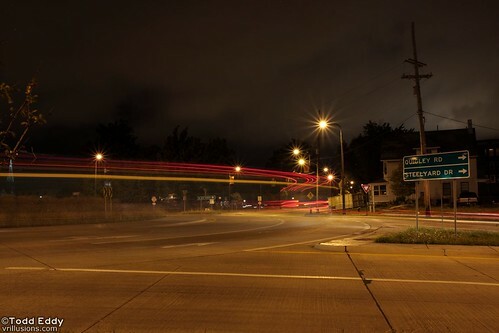 Ideally the street lights would be dimmer so the light trails would show up more. Tried various settings and couldn't find a combination that worked exactly how I wanted. The rest of it was pure luck. I had the shutter speed set so I would get consistent brightness. Didn't want to go variable and set it to bulb mode but now I realized that's how I took the fireworks picture and it may have allowed me to vary the shutter so I got a good light trail and just enough time to let the scene burn in. Also spent quite a while deciding between a white balance of what it looked like to me or a proper white balance based off the street sign. I ended up going with what it looked like to my eye instead of the proper white balance one. No, I didn't forget about this week just kept waiting and then when I decided to update this the power went out. At any rate, this is from the Ohio and Erie Towpath Trail, part of the Cleveland Metroparks that I've been a fan of before. This is in Valley View, Ohio. Took a few good ones and all I did was this one suspension bridge. Picked this one because it conveys a story in the picture. How do those two know each other? Just a couple friends? 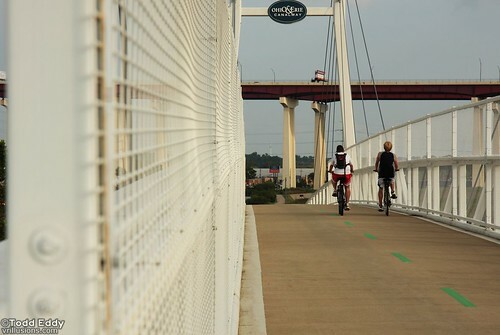 Maybe they're riding across the whole towpath although that would take days. Perhaps their training for a race. Don't know. I also took the opportunity to get a "less reflecty" version of my new car. It's also an enfused picture consisting of three images since the range was a little too much for the camera to handle. You can find that picture here. As you probably guessed this week is a picture of my new car. 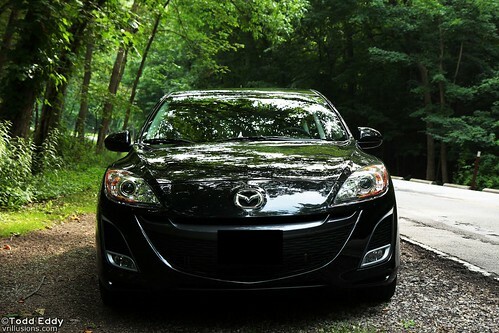 It's a 2010 Mazda 3s with manual transmission. First car with manual and after a few days it's nice not stalling every other time I move. I was going to make a long post about tips for driving a manual but really it's mainly time. Spent 5 or 6 hours in it the first day in parking lots. I think I've put 150 miles on it before the weekend ended. Only tip I'll give since it was a revelation to me was a forum posting with A guide to smooth starts. Before that I just started from the floor and just slowly let clutch out as I was touching the gas. It worked but really slow and you're prone to rolling back a lot. With this method I go to the friction point before letting of the brake so the car has some resistance to going backwards. Just enough so I can get my foot on the gas. I was horrified of hills until I read this. I also learned the parking brake method just in case but I could do a pretty steep hill by me without the parking brake just fine. 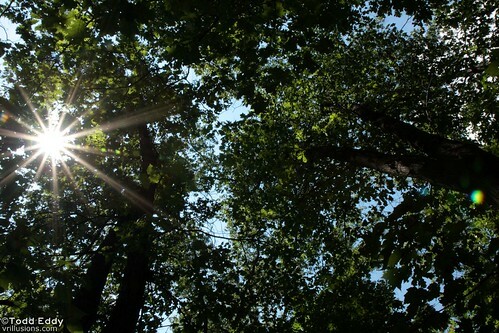 This was taken at a nearby metropark (big creek). I drove along for a while trying to find a good spot. I was trying to find a place that had some sharp turns but also where I don't have to worry about being hit. Well the road was pretty straight so I didn't have to worry about visibility. So I just parked somewhere with some cover and took a few pictures. Only thing I made sure was that I lined up horizontally with the car which was tilted pretty far. Not happy with all the reflections since it makes the picture too busy for me. Next time need to find a good shady place to minimize reflections. Actually it's probably the leaves that are making it so "busy" looking. Also looking at it now it may have looked well to have a flash underneath the car to get rid of the shadow, o well. I'll probably end up making a new section on the site for the car. I don't plan on doing a lot of modifications to it, just a few to improve visibility and personalize it a little. Maybe I'll comment in a few months how the manual transmission is. Right now I love it but I just like the car in general thus far. This is going to be short for a few reasons. First the windows Evernote app is still not working right (I'm typing this in notepad++ sans a spell checker so pardon any you see). Second, this week has been fairly busy. 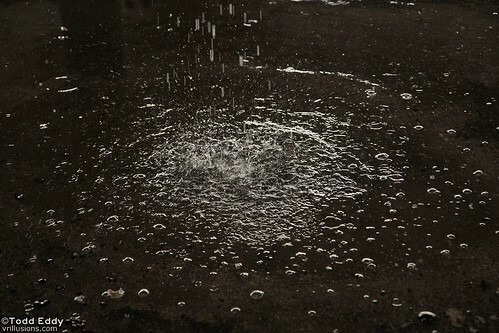 Third, I just got a new car that I'm really enjoying (I'm sure you can guess what next week's picture is going to be). This was actually taken during our family reunion. There was a nearby geocache that the kids went looking for. While they were going through the stuff in the geocache I snapped some random pictures, including these with high noon sun to get a lens flare. It's not a particularly good idea to be staring straight at the sun, even though I did have sunglasses on. Took a few and like the effect on this one the most. This week I participated in the Worldwide Photo Walk. 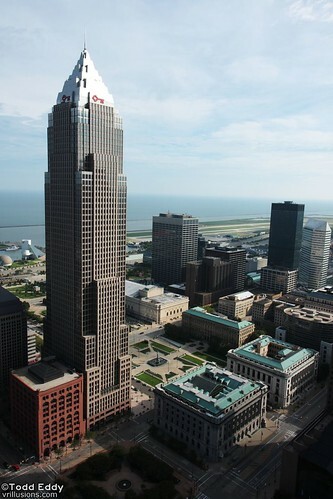 I went to the cleveland one that included a chance to take pictures from the roof of the terminal tower. Fortunately the weather held up and was able to go up there. This was my first photo walk with a group of people and was amusing seeing what everyone did. Was also amusing watching all the bystanders having no idea why there's this group of people with camera's taking pictures of cracks in walls and close up views of puddles. Don't think I got any contest worthy pictures but still got some good ones. The rest of the pictures are in the photo gallery. Apologies on the brevity of this post. I use Evernote to write all my drafts and for some reason the application is being difficult so I have to type this in the web interface that keeps messing things up. This week went to what's been called the vega building for the street it's on. Tried to get more information on the actual name of the building and couldn't find anything. Judging by what's there they did a lot of displays for various companies. Although it could have just been there as storage. In lower floors there's a lot more information dealing with chemicals and even a fallout shelter on the first floor. Another interesting feature are the rooms that are mostly filled with green light and "the cage" that's a service elevator for about 3 feet. If you follow me on twitter you would have seen my enthusiasm about getting a good picture. This wasn't it. I took a bracketed series of shots of this and planned to fuse them together. While looking through I realized a major error in my logic, it was windy and the leaves moved a lot in each frame although they were within 1/8th of a second between pictures. I could have used it if I really wanted to but would take a lot of work masking out the leaves from a single image instead of just an automated fusion of the images. 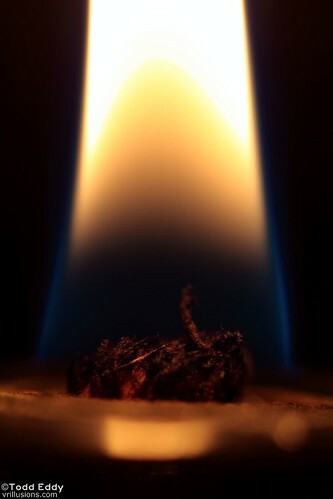 This was done out of curiosity what a flame looks like through a macro lens. Answer? Not that interesting. At least now I know. I've been a rut of sorts as far as inspiration goes. I think I've finally started to get interest in doing model shoots again, so there's something to possibly look forward to.